In the midst of last week's holiday fever, Wilco emerged to outline their plans for the new year, dropping word that first up in 2009 is a new DVD release. Via the band's holiday mail-out, Wilco gave fans the heads-up on an upcoming live film, saying the group are currently putting the finishing touches on the DVD and dubbing it Ashes of American Flags. Filmed on the band's February '08 tour, the movie includes material from performances at Cain's Ballroom in Tulsa, OK and the Ryman in Nashville, and was made with the help of Brendan Canty and Christoph Green of Trixie Films, the producers behind the Burn to Shine series and the live DVD Sunken Treasure by Wilco front-man Jeff Tweedy. According to the newsletter, Ashes of American Flags should be out in February or March. 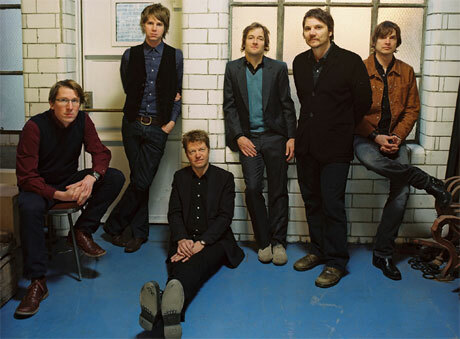 As you may recall, Wilco previously planned to make a DVD out of the performances recorded for the group's double-live album, Kicking Television, from 2005, but that was scratched after the film failed to materialize as the band hoped. Also in Wilco's recent newsletter, the band said they will get back to work on album number seven in the new year and hope to release the yet-untitled Sky Blue Sky follow-up sometime in the spring of '09. And while Tweedy does have a few solo shows slated for late January in the U.S., Wilco are not set to get their touring machine back up and running until the release of the new record.